where, t is measured in seconds and s in meters. a) Find the acceleration at time t and after 3 seconds. c) When is the particle speeding up? When is it slowing down? 1. The Absolute Maxmimum Value of The Function is 2. 2. The Absolute Minimum Value of The Fuction is 0. WHICH OF THE ABOVE STATEMNTS IS/ARE CORRECT? Q1. Let f be a twice differentiable function on R.Given that f''(x)>0 for all x element of R.Then which one is true and why? a.f(x)=0 has exactly two solutions on R.
c.f(x)=0 has no positive solution if f(o)=0 and f'(o)>0. The vertical straight side is Y, the width at the base and at the widest part of the arch (Diam) is X.
I know that the perimeter is 4. 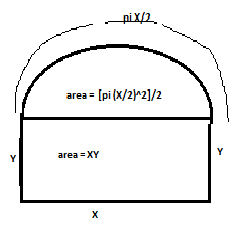 Find X if the area of the frame is at a maximum? f(x+y) = f(x) + f(y) + 2xy - 1 " x,y. f is differentiable and f'(0) = cos a. Prove that f(x) > 0 " x Î R.